Photoshop credit to Joey Miller. A lot of you are aware that we’ve been rather puzzled by the Sony FE 70-200mm f/2.8 GM OSS lens. It didn’t test like we expected it to, which led us to reevaluate our testing methods with outside consultants (we’re now comfortable they are valid, BTW), question the accuracy of different types of autofocus, and search for the meaning of life. 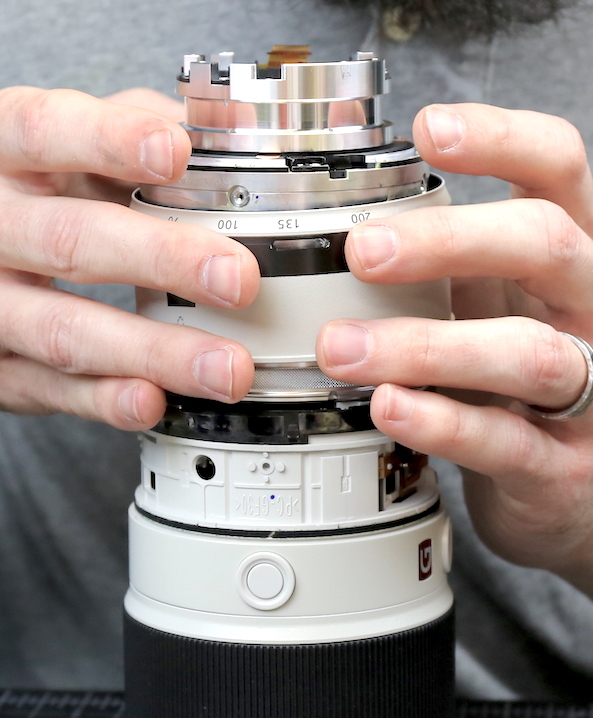 The Sony FE 70-200mm f/2.8 GM is just a bit different. It has three aspheric elements, one of which is an extreme aspheric, and six extra-low dispersion elements. Ultra-low dispersion elements are pretty standard in telezooms, but aspheric elements not so much. 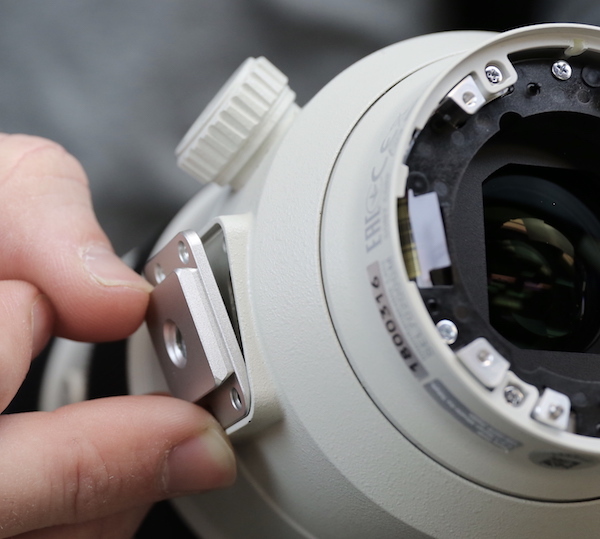 It also has a unique autofocus system with linear motors moving a rear focusing element and a ring ultrasonic motor moving the larger front focusing group. 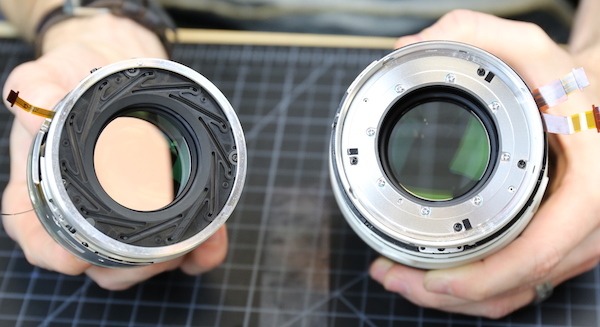 So we were pretty interested in getting a better understanding of how this lens works. From the outside, the FE 70-200mm f/2.8 GM OSS looks pretty much like every other 70-200 f/2.8 zoom. 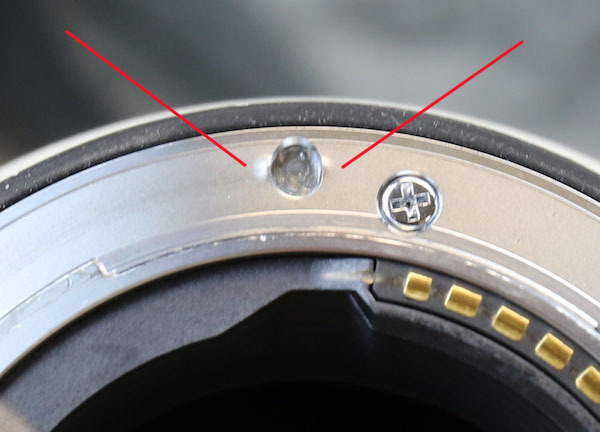 Before we start I’ll show you one close up of something we’re seeing fairly frequently with this lens: some wear around the locking pin. These are rental lenses, of course, but all fairly new to the fleet. Most of ours now have some raised metal (red lines) on either side of the lock-pin slot. This isn’t causing any problems yet, but if you have one, you may notice the same thing. If it worsens it may could cause some rotational looseness or a bit of mounting resistance, but we haven’t seen that yet. We started the teardown from the back. The rear baffle comes off after removing a couple of screws. The bayonet mount comes off after removing four screws. 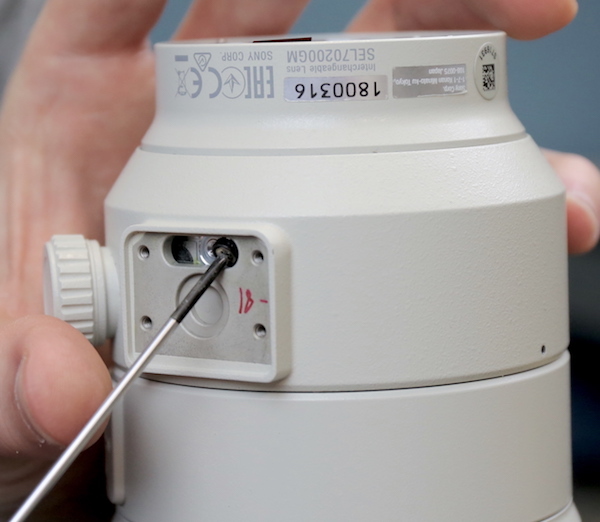 It has a relatively robust rubber weather seal between the bayonet and the lens. Under the bayonet, there’s a set of shims in two locations. This would correct lens tilt at the mount. 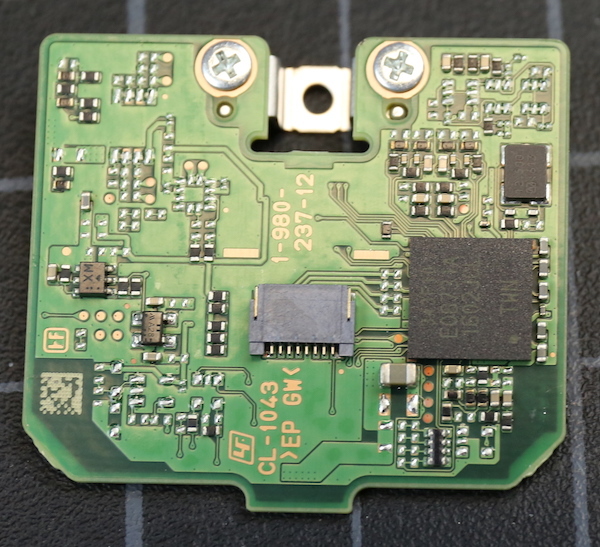 One other thing we found a bit unusual: the PCB is small and only has one large flex connecting it to all the camera’s electronics. A typical 70-200 f/2.8 would have at least half-a-dozen connections. 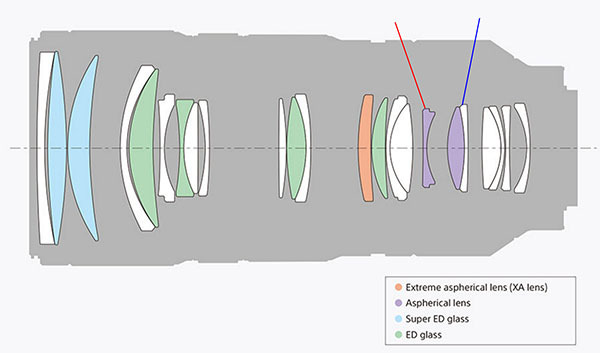 We speculated that the lens must do a lot of processing internally rather than using the camera’s electronics. 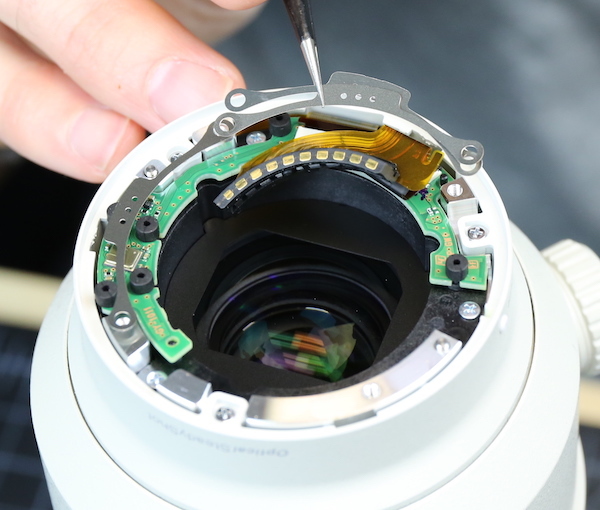 Given that there weren’t a lot of chips on the PCB, we thought we might find another PCB down in the lens, like Nikon lenses have. 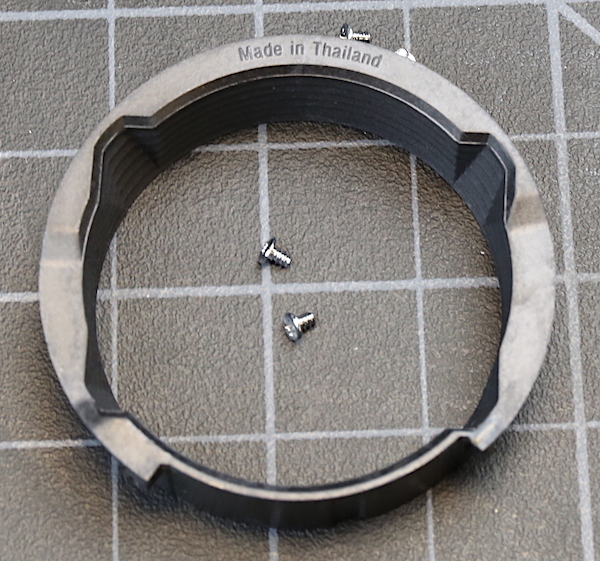 The next disassembly step is to remove the built-in tripod ring. This is actually one thing some of you might want to do someday if you get some sand or grit in it. 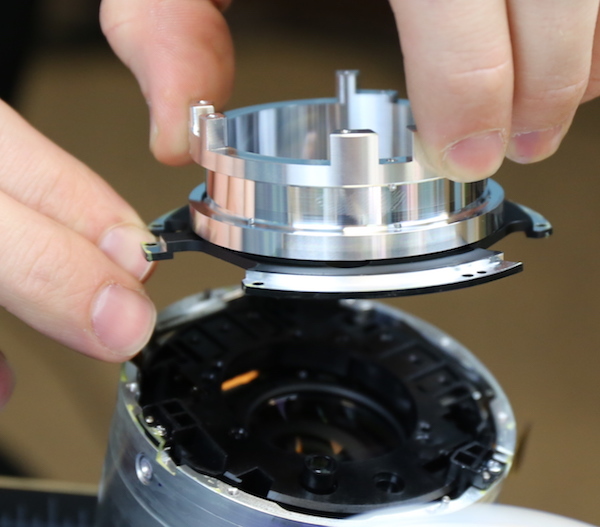 We start by removing the mount foot plate, which as you can see is a (very slight) modification of the plate Nikon 70-200’s use. It does appear thicker and more robust than the Nikon version, though, which is a good thing. Once the plate was off, we removed the four tripod collar rollers through the opening the plate was in. These are nice, solid rollers with thick nylon collars, built as they should be. 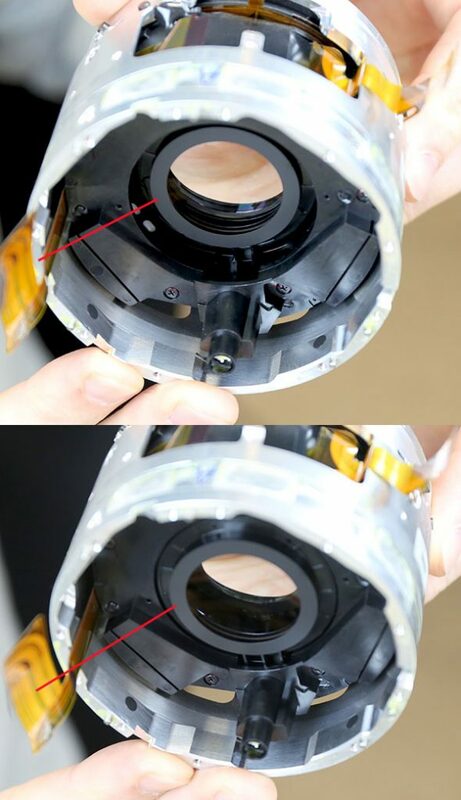 Once those are removed, the tripod collar slides off of the back of the lens. You can see thick lube around the inner barrel above, and there’s a generous amount in the collar too. With the tripod ring off we can see some of the inner barrel. There were some taped over windows we peeked under and you can see the coils of the image stabilization system in there. 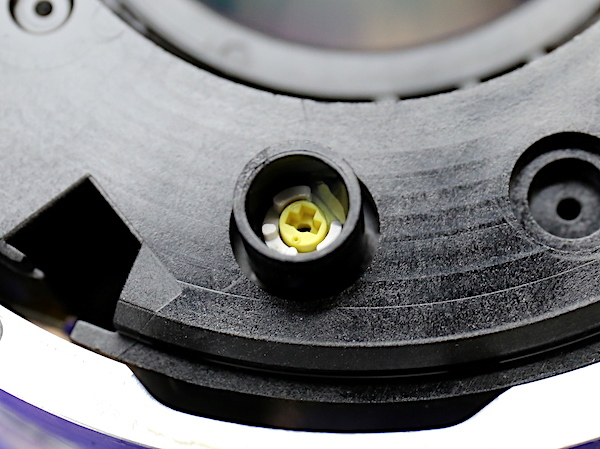 Also note that there are nice thick environment resistance seals at both the top (white) and bottom (black) of the tripod ring assembly mount. You’d think that would keep sand and stuff out of there. It certainly seems like it should. But no, it doesn’t; not all the time. Speaking of that top environmental resistance seal, it’s attached to the outer rear barrel which gets removed next. 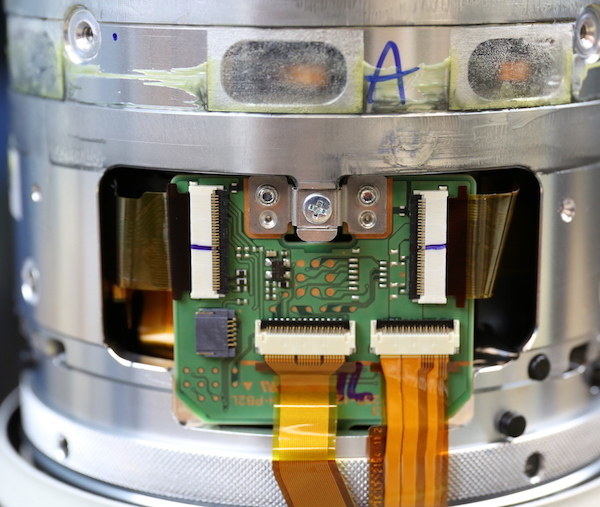 The rear inner rear barrel is exposed now, showing a good look at the single flex that carries all of the lens’s electrons. You heavy metal fans are pleased to see all this thick metal making up the inner barrel, I know. The switch panel comes off next, after removing screws and disconnecting a couple of flexes. As you’d expect, there’s a rubber gasket to seal this area too. With that removed the mid barrel slides right off. 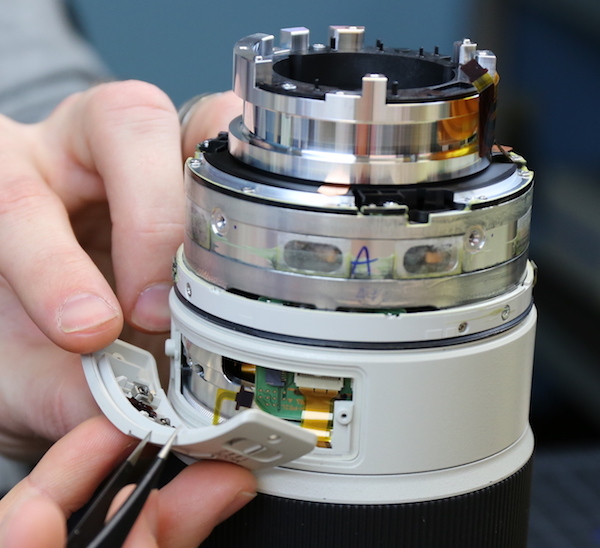 Notice another rubber seal on the forward end of the middle barrel where it tucks under the zoom ring. The inner barrel at this level has an interesting feature — windows that allow access to things like a zoom position sensor. On the other side is a window over the secondary PCB we thought would be in here somewhere. We thought this was a nice feature giving access to these areas without requiring further disassembly. We should have realized there was a good reason to provide access to areas without requiring further disassembly. But we didn’t. This PCB has to be removed, obviously. The underside view shows it apparently has more processing power than the main PCB we removed earlier. The next step was to take the rubber off of the zoom ring. 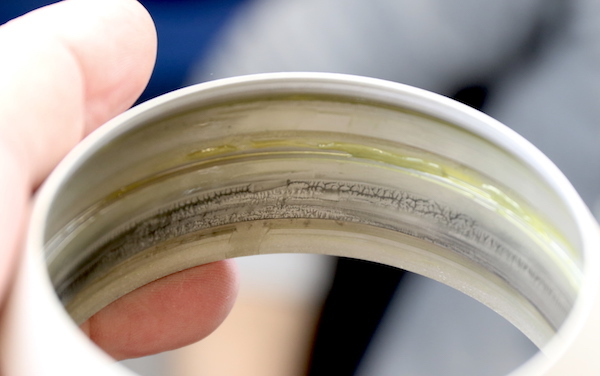 Underneath the rubber, the various slots and holes in the ring are covered by a thick layer of tape, again to provide environmental resistance. Once we got this out we could slide the zoom barrel off the lens. As an aside, have you wondered what that small silver ring with the rough grippy surface near the zoom ring is yet? We sure did. We’d never actually seen one of those before and had no idea what it would be. Stick around and you’ll understand why we named it The Southern Fairy Tale Ring. But back to where we are. With the glue removed the zoom ring came right off. Don’t worry, we have plenty of replacement glue. And we needed it because Sony just loves this stuff, it’s all through the lens. It probably does help with weather resistance, but it makes it a pain to work on. Looking at the lens at this point, it seemed pretty evident that silver ring with the grippy surface was supposed to come off next. But it didn’t want to. Finally a combination of picking out more glue from under the ring, adding some glue softener, and Aaron’s really strong grip and realizing it was a reverse-threaded ring got it moving. But we spent about 30 minutes looking at basically this picture and trying one thing after another. 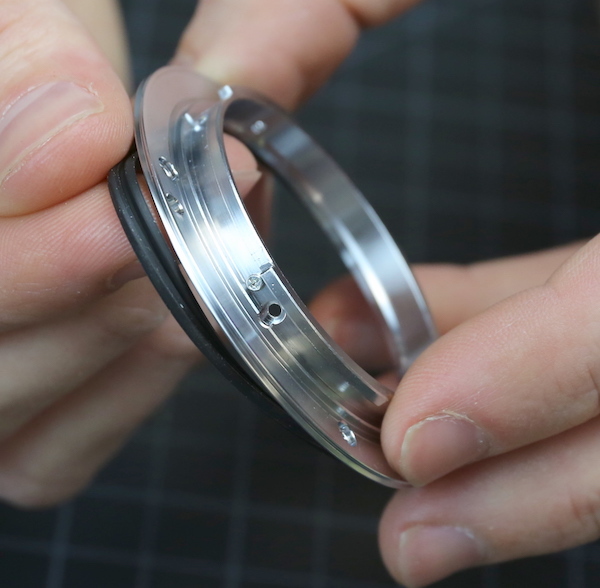 A bit to our surprise, we discovered our ring was a lock ring that held the two halves of the lens together. 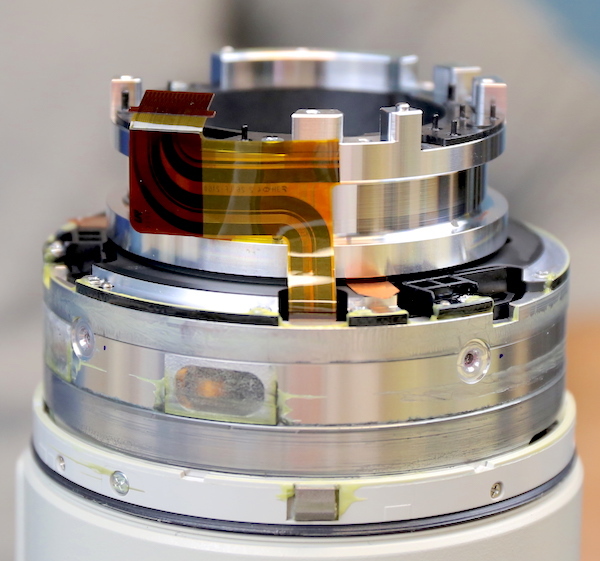 Here’s a view of where the lens divides; the bottom (mount) half is the one containing the aperture ring. 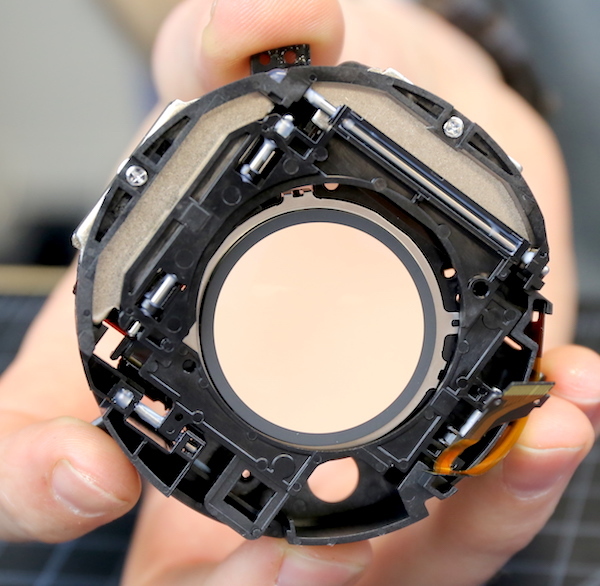 We knew this lens had a problem focusing, but weren’t sure if it was with the front or back focusing assembly. We were kind of in the mood to look into the back part, mostly because that part looked more familiar to us. So that’s what we did. First, the inner light baffle was removed. 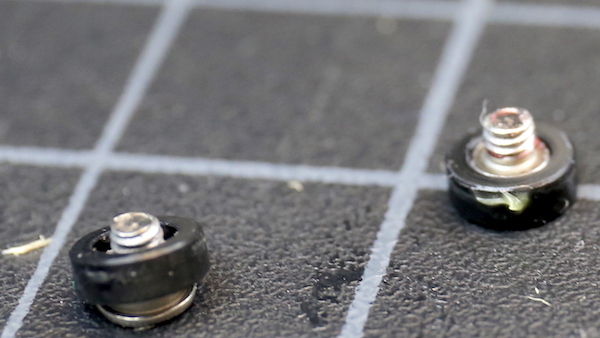 The next lens element was held in place by three screws and was obviously not a centering element, so it was removed next. 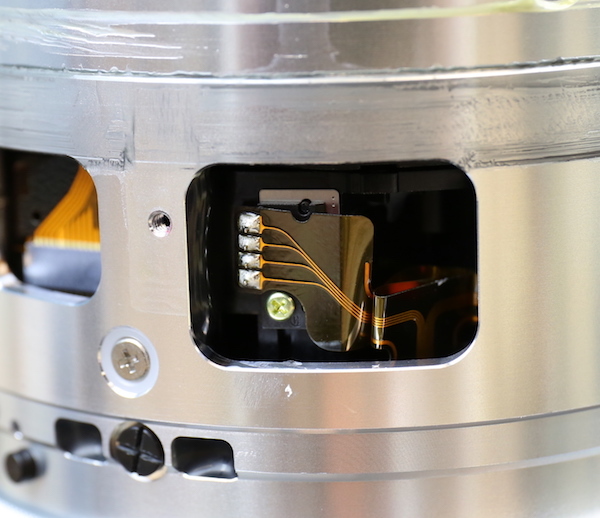 You can see there are three copper shims which are under it; they obviously can be inserted from outside the barrel. 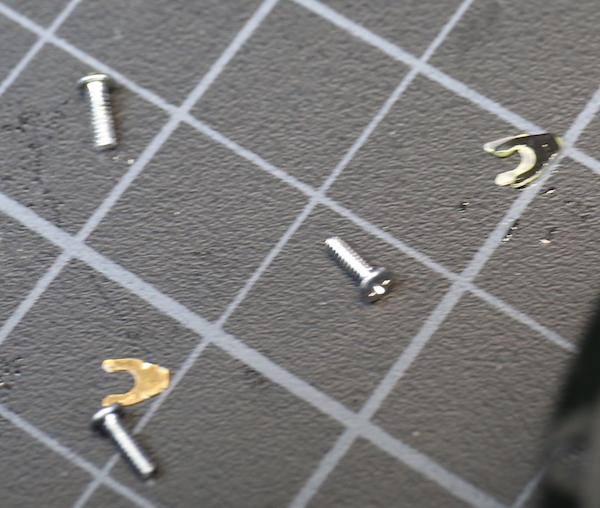 Since these were all 0.15mm thickness, we assume they were for spacing only, not for tilt adjustment. 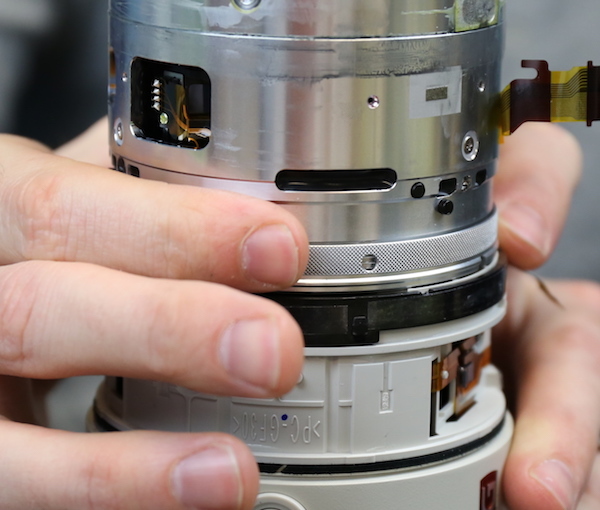 Removing a set of 6 screws and two pins let us take the rear inner barrel off the assembly. 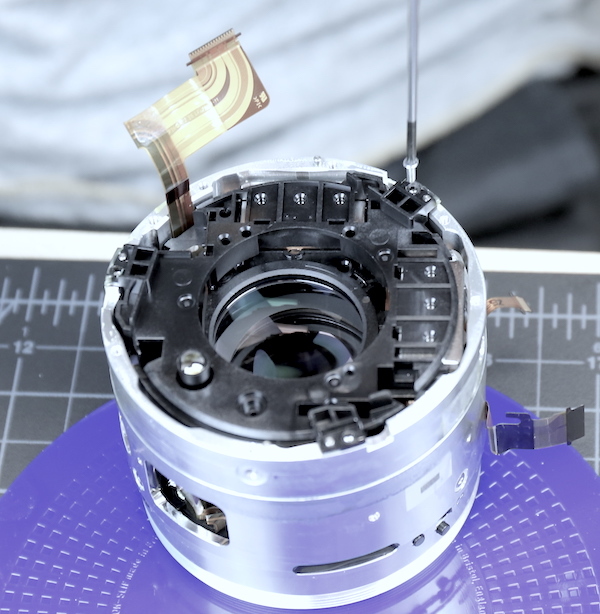 We could have left the lens element above in place and done this, but, well, it’s a tear-down and all. You can see this is some seriously solid metal back here. In a lot of lenses, the stabilizers are rather delicate and fragile things. This one is as fragile as a defensive tackle; it’s massive with thick metal plates and rods. 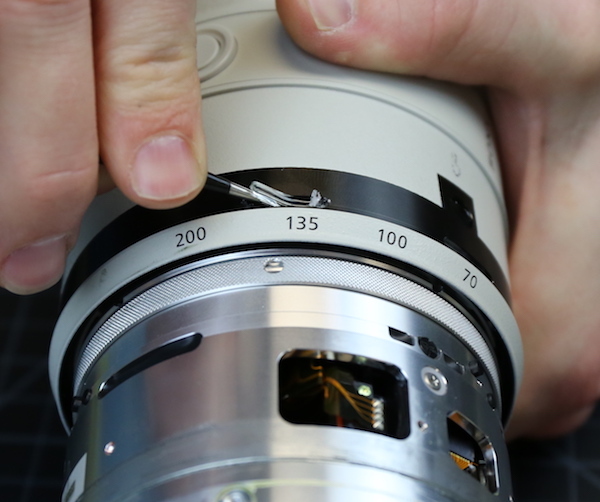 I doubt this will be the first thing that breaks if you drop the lens. Interestingly, the IS unit is shimmed and the shims were not the same thickness, so the IS unit is being adjusted for at least tilt and perhaps spacing. That’s not unheard of, but not very common either. It probably needs to be a hefty unit because the stabilizing element itself is a large, aspheric doublet (blue line). Again, something kind of different from Sony. Image courtesy Sony USA, labels added. With the IS unit out of the way, we can look down on the top of the rear focusing group. The small, raised, yellow screw you probably noticed in the image above actually adjusts the vertical rod that the electric focusing motor slides up and down on. You can see in the closeup below that it’s eccentric; turning it would move the rod a bit at this end. One possibility was the drop had knocked the rod out of position and the electronic motor wasn’t sliding properly. But the element (red lines) moved very smoothly through its full range, so that didn’t seem to be the problem. We had assumed this was basically a compensating group for close focus, but the amount of travel makes us rethink that. It may be a more active participant in focusing than we realized. 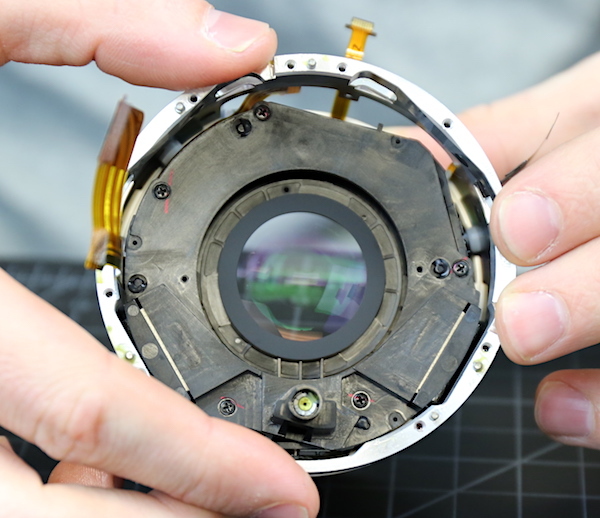 So, now nearly 3 hours into this teardown (3 hours is usually the time it takes to complete a teardown and reassemble the lens) we did something we never had done before. No, not break into tears – we took a snack break. 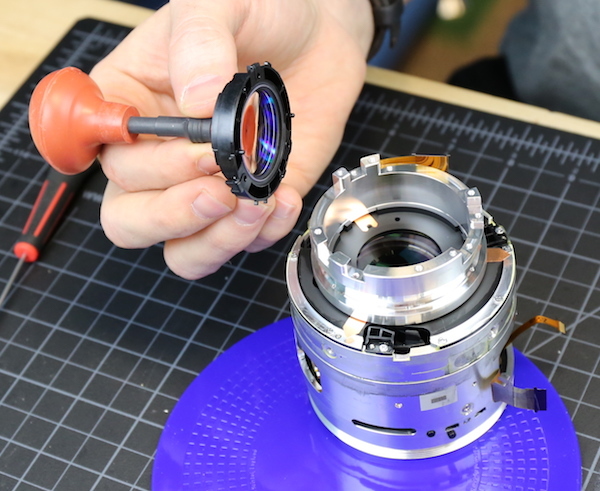 What we should probably have done was quit, put the damn thing back together, and sent it in to Sony for them to tell us it would cost slightly more to repair it than it would to buy a new lens. That’s what we should have done. But Aaron and I, we’re stubborn; and overconfident. The Sony 70-200mm f/2.8 GM has a lot of solid construction with heavy metal barrels and proper weather sealing. The rollers, cams, and screws seem appropriate for what they do. They aren’t over-engineered by any means, but certainly adequate. 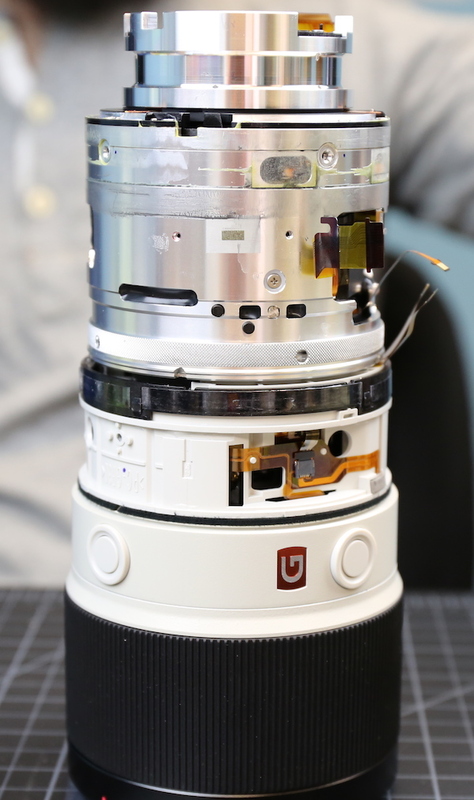 The lens is designed to take apart in the middle. That’s really different for a 70-200 f/2.8, but we’ve seen some super telephoto lenses that are similar. I doubt it’s going to break in half if you drop it. Or more to the point, if you drop it hard enough to break it in half, other stuff would be breaking too. There’s a lot of impressive engineering in here, but not what we (from a take-it-apart perspective) would call elegant. 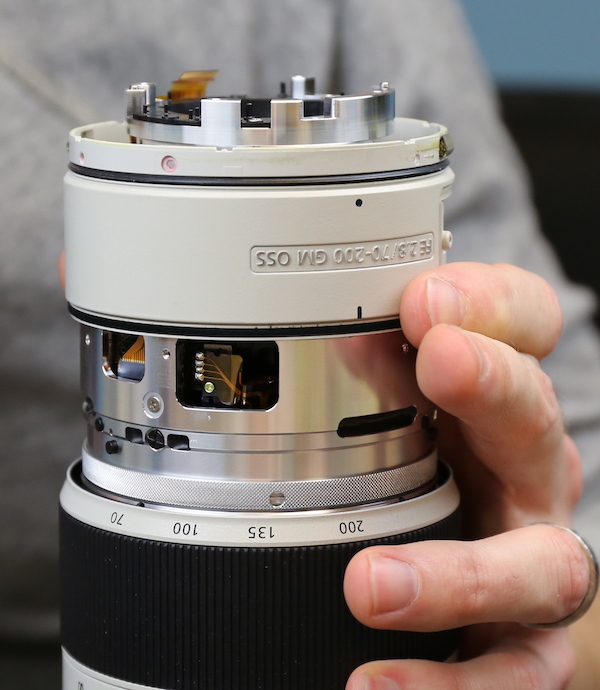 It looks similar to a Nikon design, which isn’t a bad thing, Nikon makes lots of great lenses. That are a pain to work on. Pain to work on often (but not always) translates into expensive to repair. thanks for your great teardowns. I have a small problem with my Sony SEL 70-200 GM 2.8. And although there is the following situation. When I take pictures in cold temperatures (around 0 degrees) for about 30-40 minutes outside, the camera does not show any aperture and the AF does not work anymore. I noticed that the camera start (until a picture is shown) is approx 5-6 sec. If I come back into the heat, everything will go back after about 20-30 minutes. 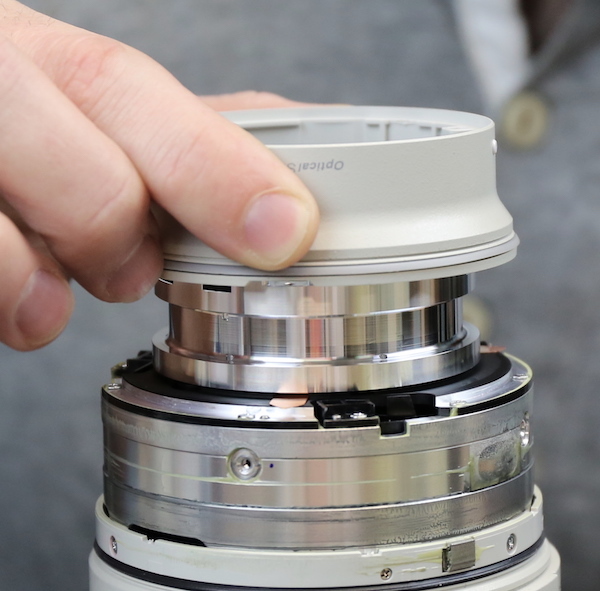 The problem exists only with this lens and with both bodies (A7 and A7 M3). Whether the camera is cold or not does not matter either. As far as the situation. I then brought my lens to service and was able to pick it up again today. According to the service technician there, the error is known to Sony, but they do not know at the moment what it is. Sony recommends replacing the motherboard – according to the service technician this does not solve the problem. Since I have to pay it myself, I was advised not to swap the motherboard. They have 4 or 5 70-200 GM with exactly the same problem – but it does not necessarily have anything to do with temperature. For me it is only if the lens is longer in the cold. Since there is no solution at the moment I have taken the lens with me. Are you aware of similar problems? I can honestly not imagine that a solution is sought …. 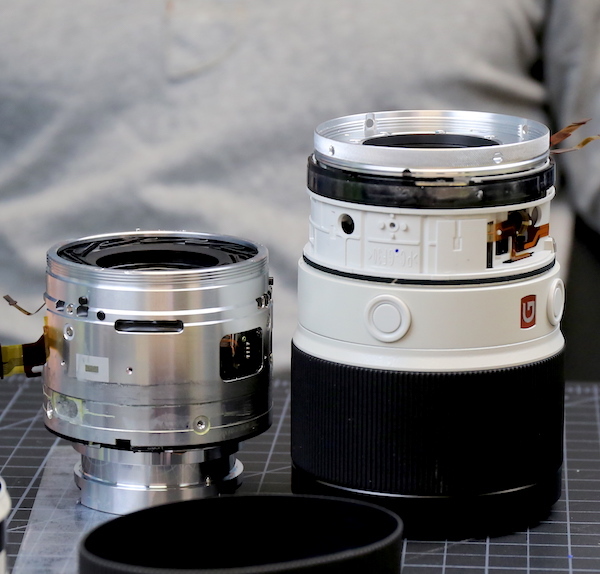 the lens has been on the market for almost 3 years. The lens is from May 2016.
anyone have clues to why samsung nx2000’s cameras suddenly becoming a brick? As a computer guy, and not an OE, I find your teardown presentations fascinating. At age 8 or so, it became impossible to resist the desire to know how spinning THIS dial made THAT indicator move on my Lloyds transistor radio. Out came my Dad’s worn-out #2 phillips, and minutes later, mystery solved. I’ve been fearlessly taking things apart ever since, particularly when they’re too expensive to throw away (which applies to both computer and camera stuff). But I am not brave enough to attempt a lens teardown, so I thank you for letting all of us satisfy our curiosity for free. And thanks also for everyone’s contributions to the thread. Very interesting stuff! Search the blog. They did an ART a while back. What a great resource you folks are! Nearly said ‘guys’, but hoping a few from the distaff side may be involved. The trolling just degrades the signal-to-noise ratio to the point where nobody can tell what’s really a problem. That was really my point, and that’s why I chose the 85/1.4 “shavings” fiasco as an example. Now that I’ve seen part deux, it’s clear that the mid attach is a significant vulnerability, though of a more insidious sort. It won’t lead to lenses falling apart (too many screws). They’ll just get really soft. 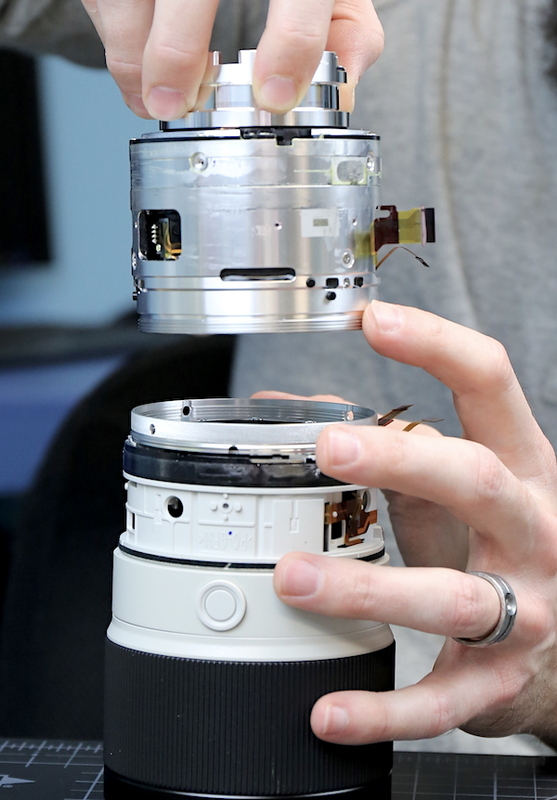 So you’re more worried with the possibility that people can troll Sony than with the possibility that a lens this expensive can split in half? A lens at this price point should last a lifetime. Maybe the trolling can make Sony rethink the build quality of their lenses, and in the end we’ll get better products, so bring on the trolls! First, that 1970s truck would need constant maintenance. Nowadays you get a Prius (or any number of entry-level autos) and run it years on end, only checking the tires and exchanging oil + filters. Out of 4 cars driven on about 200k kilometers (125k miles) only one needed a repair for some brake component. But still can’t hide the fact that expertise, machining, production line cost is very costly, so the price we paid are tiny fraction of the setup costs and can be considered ‘cheap’ disregard where it is made or labour used. Jim, if I recall they had insurance so they aren’t getting charged. C’mon then, it’s Monday here now (NZ)! Does the customer who dropped the lens get any credit for this educational exercise or will you be charging them by the hour? Why do you think they manufacture in Thailand, Malaysia, China, etc? 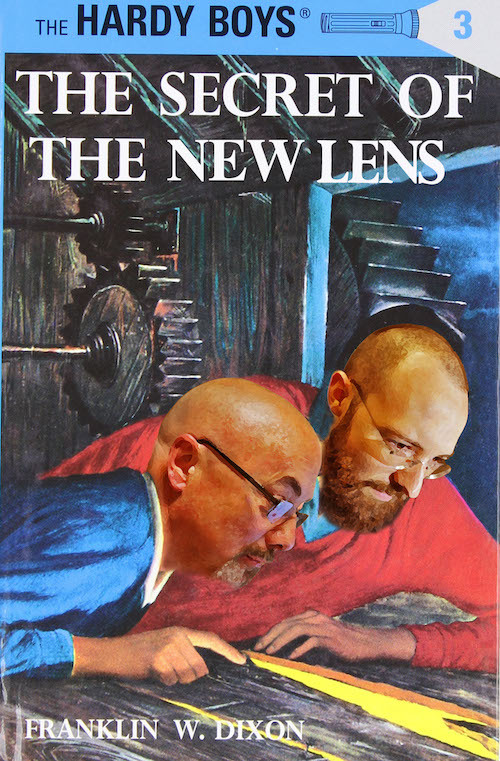 Cheap labor is the only way to make the lens “cheaper”. It will be out on Monday! 🙂 Sorry for the drama, I couldn’t write this all in one post. OK, not sorry for the drama. But really Part 2 is almost too long by itself. Give us the Part 2! Creating the optical lens design is one thing, an individual could do that. But creating all of the electrical, mechanical, and computer engineering that goes into it requires a team. There is a lot of ‘reusing’ both as starting places for the optical design and even moreso for the optomechanics. You do get to see the fingerprints a bit. For example, some lens designers what an even look and smooth bokeh while others are more interested in maximum resolution. Much moreso we see the fingerprints in the optomechanicals. Canons look like Canons inside, Nikons like Nikon, etc. 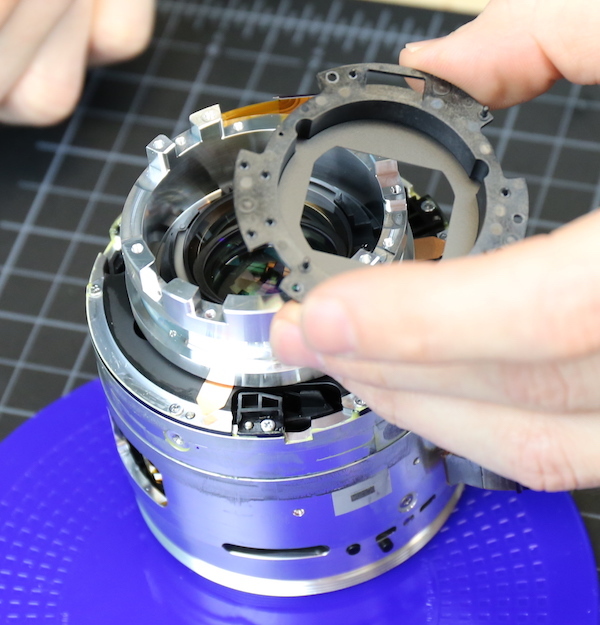 This Sony has a lot of Nikon look inside, but not all of the Sony lenses do. Silicone glue sounds like it might be handy for other photo-related projects—what brand do you prefer? I took apart a Jupiter-3 lens and got it back together again. That was Soviet engineering from 1920s German blueprints. I love reading Cicala et al. 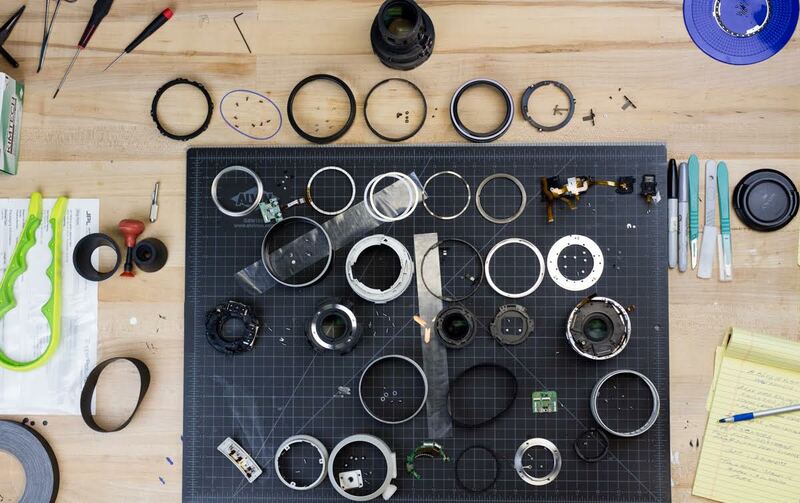 taking apart and reassembling the modern lenses. They do not seem half as pricey when I actually see what’s inside. I do not think that the engineering elite has ever before been this far detached from the users of their products. I do realize that I belong to an earlier era. So the money any lens manufacturer asking really is like crowd funding or at wholesale price as from design to manufacture plus design knowledge knowhow etc…what we pay for then is absolute bargain viewed from this perspective. Wow Brandon, that’s a lot of very interesting stuff! Thanks for sharing it. That “grippy surface” is called knurling. Thanks for the post. 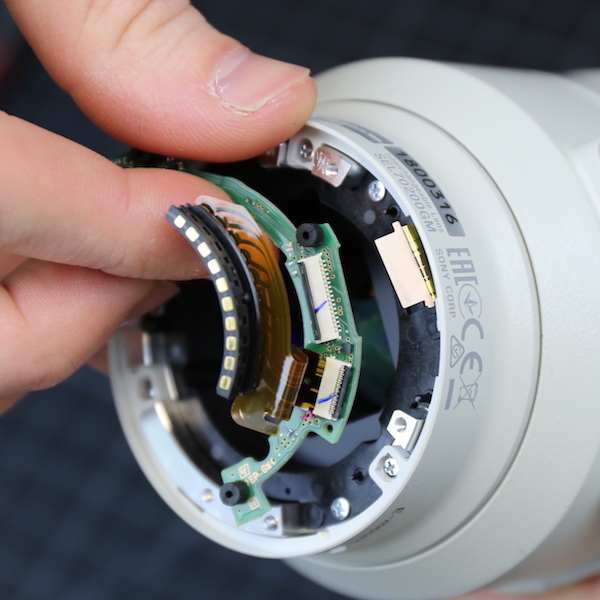 These blog posts should be added to the warnings for disassembling the lens in the warranty information. My understanding of the problem for long lenses in the Sony E system is the current OSPDAF algorithms/implementation for when a telephoto is at extreme defocus are struggling to make phase measurements so they have to rely on CDAF and it introduces hunting. It’s the biggest advantage separate PDAF systems have over all mirrorless cameras. There are workarounds added into the Sony cameras with options like pre af where the camera is always searching for one focus point but they can lead to problems as say you have your lens pointed to the ground then lift it up to shoot a bird in the sky you will see the extreme defocus problems as will be focused at the mfd but needed to be at infinity plus the sky will confuse the CDAF. Can confirm. 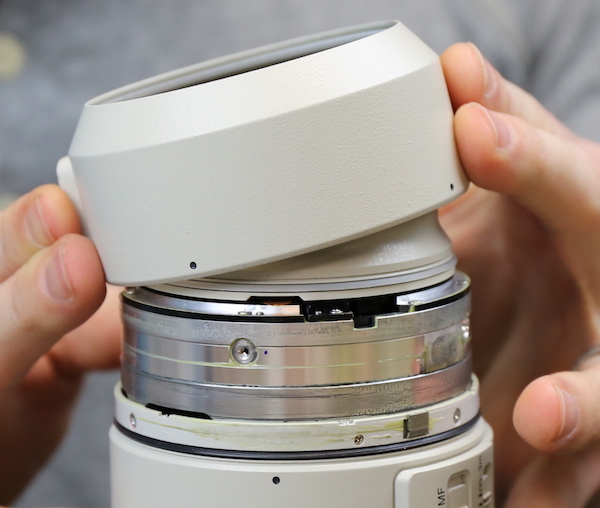 I’ve seen a couple Canon 70-200 f/2.8L Mk1s that turned into push-pull lenses (with about a centimeter of extension in the middle) after being dropped. One of them had to be focused by pointing the lens up or down (depending on which way you wanted to shift the focus) and shaking it. Canon’s dual-pixel scheme uses every pixel on the sensor and so can (and does) create adaptively-sized baselines for cross-correlation based on aperture. Sony’s scheme only masks off a small fixed subset of pixels on the sensor, and is therefore prevented from playing those sorts of games. As aperture becomes smaller you need to cross-correlate across smaller distances, and a masking-based scheme like Sony’s is constrained (by noise/artifacts) from using groups of adjacent pixels, so they will unavoidably have a larger minimum aperture. Even with its adaptive-baseline trick Canon’s dual-pixel scheme doesn’t perform very well at f/8 and beyond. I have a 1Dx II, and video AF gets much slower and less reliable at those smaller apertures. What I suspect is happening is that as the range of incident angles becomes small the microlens selects less strongly between left- and right-incident rays, such that the left- and right-pointing photosites have high crosstalk. Sony’s scheme would have the same limitation. Both of Sony and Canon’s on-chip PDAF schemes share another important limitation, though: In my experience they’re both sensitive only to vertical edges. In Sony’s case they theoretically could mask on both axes, but they don’t seem to have done so at least in the A7R ii. 1. 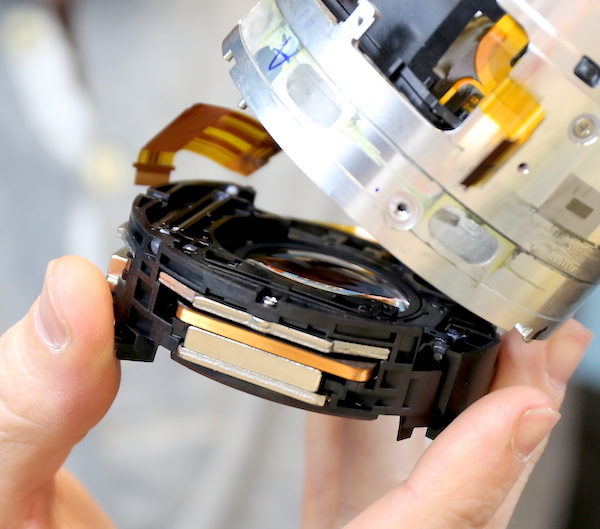 All Sony FE cameras use CDAF in whole or in part, which creates the requirement for a high-frequency fine focus drives. 2. Sony cameras rely heavily on CDAF for video, to the point where they disable video AF on PDAF-only adapted lenses. Canon’s dual-pixel scheme uses every pixel on the sencor and so can (and does) create adaptively-sized baselines for cross-correlation based on aperture. Sony’s scheme only masks off a small fixed subset of pixels on the sensor, and is therefore prevented from playing those sorts of games. Both of Sony and Canon’s on-chip schemes share another important limitation, though: They’re both sensitive only to vertical edges.